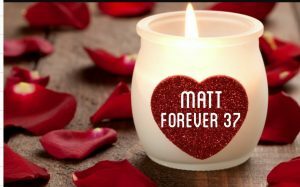 Matt, It’s hard for me to believe that you have been gone for 45 months and 18 days. But who’s counting? Right. I am. I’ve been counting the days as they turned from weeks to months, then from months to years. I’ve watched as Spring brings new life to the earth. Plants burst forth in a riot of color. Birds fly in and out of the garden houses building nests in anticipation of new life. The summer sun warms my soul as the earth continues its beautiful transformation. In the blink of an eye Summer becomes Fall. Magnificent colors continue to mark the earth with incredible beauty. Before long a cold wind blows bringing in the darkness that announces the arrival of Winter. The changing seasons remind me of another time of counting. I counted the months while carrying you. Praying we would make it past that first trimester sailing along until you decided to announce yourself to my world. You were a Summer baby. You became an incredible man who died on a cold winter day. You took your first breaths on July 30th and your last on January 3rd. I look at your stone and compare the J’s and 3’s asking myself the question that has no answer. Why? I started a garden to honor you. To have a place to come and talk to you. A place to scream and cry. To be alone in the grief that continues to grip my heart as I see your name engraved on that cold stone. You never wanted to be in the ground. Some of your ashes are scattered here. Your garden changes with the seasons. My grief remains the same. 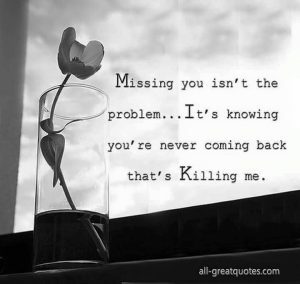 Somedays it hits without warning. I will be digging in the cool soil clearing out the old plants, while planning for the new. My mind focusing on colors and smells. A memory hits of another time when we knelt side by side planting flowers in another garden. Both muddy and laughing as the dogs did their best to trample our new plantings. I can hear your laughter and see your smile. I am reduced to tears as that one poignant memory leads to another. As the seasons change your garden follows. Summer perennials attract butterflies and colorful birds. Summer brings another reminder that you will be forever 37. Summer brings birthday candles to your garden. I light them and sing out loud. Watching the flames flicker in the soft breeze. I wait for them to blow out and wonder if you are there with me. Memories of past celebrations come and join us. Days when we thought time was on our side. That birthdays would never end as abruptly as they did. The peace of the garden hugs my heart allowing my grief to be present. Fall brings a new beauty to your garden. 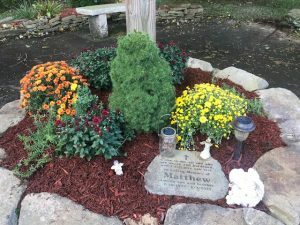 Mums in an array of blazing colors surround your stone. Dead flowers are removed allowing room for a new brightness. Bright red cardinals surround the feeder as leaves fall covering the damp grass. An unwanted reminder that soon the ground will freeze and the season of planting will be done. Winter brings a deep stillness to your garden. It will surrender to sleep just as you did that cold January morning. Do not fear. My need to feel close leads me back to you. I will continue to come and brush the snow off your stone. I will continue to tend to your garden as I tend to my heart. I will keep the feeder full giving the cardinals a reason to come. I will sit quietly allowing my grief a place to be as the seasons change and memories find me. Similar to the passage of time and the changing of the seasons my grief marches on………..